A fantastic selection of licensed Movie horror masks that will give you nightmares and blow you away. If you like nice clowns then you will hate these very frightening and gory horror masks! Fantastic zombie masks, shocking horror masks, and the most unbelievable monster masks straight from your worst nightmares! Hideous scarecrow masks and the scariest of pumpkin masks are available right here! Now you can be the Devil, Satan, or a demonic creature from hell with one of these fantastic horror masks. Make-up artist in film and television made these Realistic masks from latex so you can get results simular to SPFX masks. If you are looking for strange Alien masks to purchase these ones are out of this world! These Face Masks include, Zombies, Devils, Monsters, Creatures . . and come with straps. Ripper masks consist of a hard inside layer with movable jaw and a soft fall away face piece. Take a look at our Latex comedy mask selection . . .You wont know wether to laugh or Cry! 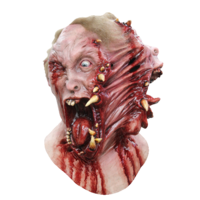 Looking for Horror Masks with Amazing Moving mouths and Action jaws? Take a look at these! Hand painted Chin strap Horror masks that leave your mouth free to eat and drink and to scare! These Quality latex masks come to life just download the free app on your mobile phone slide your device into the secure pocket in the front of the mask and bring your mask alive!